Invision Community is used by some of the world's biggest game brands, proudly enabling gamers to connect with the creators of their favourite titles. These sites attract millions of visitors between them and thousands of posts are added daily because of their high profile. But what if you're just starting out, how do you convert casual visitors to members, and what's the best way to set up your community? I got talking to new customer Darrell, interestingly named Mr. Fierce God on our community. While you may expect that this portrays a fire and brimstone hothead, you'd be wrong as Darrell is one of the nicest people you'll meet. 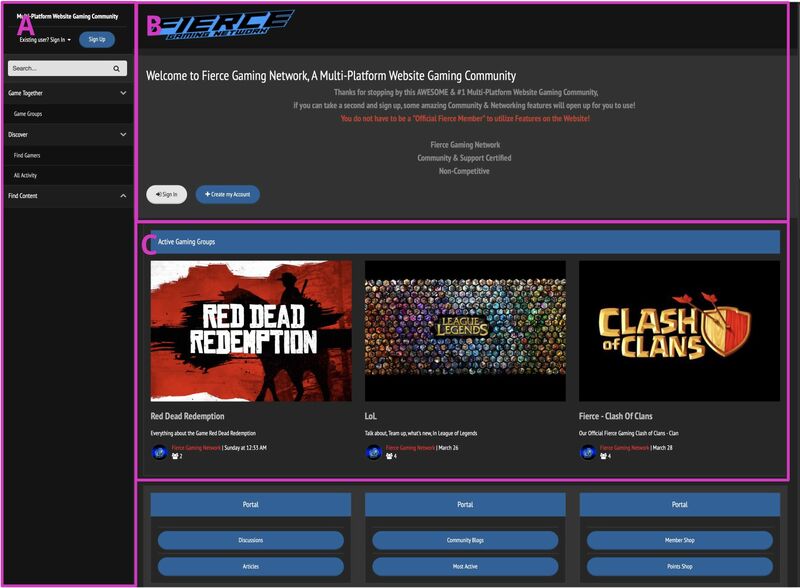 Darrell runs the Fierce Gaming Network and I was impressed by the way he's set up his site and wanted to share my thoughts on what he's done well. The first thing I noticed is that the forum index is not the home page for the site. For a gaming community that wants to focus on more than just user conversations, this is a good move. A. The home page has multiple points of entry, and the sidebar menu unobtrusively offers short-cuts to various parts of the community. B. We have a large call to action to either login or register. This box also explains the benefits of registration clearly and enforces that registration is a very quick process. One optimisation that may be worth looking at here is to add the "Sign in with Facebook / Microsoft" buttons on the box to persuade even more to register right away. C. Fierce Gaming Network also makes great use of Clubs to segment their audience to specific software titles. Re-using instantly recognisable artwork as the club cover image will entice fans of those games to visit. Scrolling down a little shows the "Member of the month". As humans, we are drawn to faces instantly, and this humanises the site and "unmasks" some of the popular members, making the site less intimidating. Moving down a little more we see the "Our Picks" section which highlights the best content from the community. Our Picks is a great way to get visitors to engage with your content. Good use of cover images draws attention and makes it clear the kind of content you're going to read. Darrell makes great use of several lnvision Community apps to build the site, and has set it up well. New users get to the site see handpicked content, fellow members and the benefits of joining all in one place. It's a great start and I look forward to seeing Darrell's site succeed. Are you using Invision Community to build custom homepages for your community? Share them in the comments below.